Echinacea is a medicinal herb first used by Native Americans to treat infections. Today, it is most often used to treat the common cold. It is unclear if echinacea works, as the research evidence is conflicting. Echinacea is also used to treat other infections like the flu, herpes and ear infections, but its effectiveness is unproven. Echinacea can cause side effects and may pose health risks for certain people. Talk to your doctor before taking echinacea. When used short-term, echinacea seems to cause few side effects but long term use has not been adequately studied, according to MedlinePlus. Potential side effects include fever, nausea, vomiting, stomach pain, diarrhea, constipation, sore throat, dry mouth, headache, numbness or tingling of the tongue, dizziness, sleep problems, confusion, joint pain and muscle aches. Echinacea can cause serious allergic reactions, so if you have asthma or other allergies you should talk to your doctor before taking echinacea. People who are allergic to plants in the daisy family, including ragweed, mums, marigolds or daisies are at particular risk. Some people use echinacea topically to treat skin conditions like boils, burns or eczema, but this can cause a rash, redness or itching. Echinacea might boost the immune system in ways that may worsen autoimmune diseases in which the body’s immune system attacks healthy tissue. If you have an autoimmune disorder, such as lupus, multiple sclerosis or rheumatoid arthritis, do not take echinacea without consulting your doctor first. If you have tuberculosis, leukemia, diabetes, connective tissue disorders, HIV/AIDS or liver disease, do not take echinacea without consulting your doctor first as there is some concern that it may worsen your condition, according to the University of Maryland Medical Center. Avoid echinacea if you are pregnant or nursing, as its safety has not been adequately studied. Echinacea may increase the effects of caffeine, raising the risk of side effects like nervousness, headache and a racing heart. 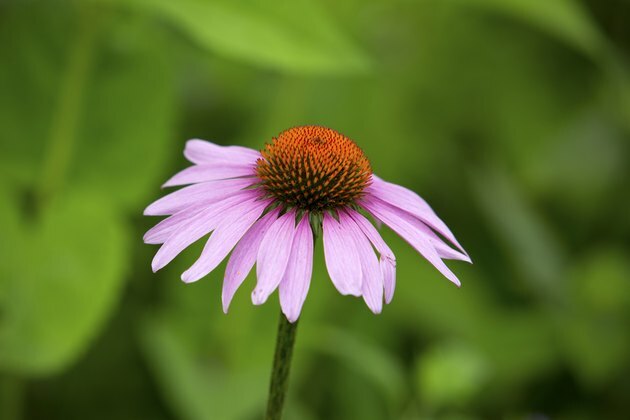 Because it may boost the immune system, echinacea may reduce the effectiveness of medications designed to suppress the immune system, like prednisone and corticosteroids. Other drugs in this category include azathioprine, basiliximab, cyclosporine, daclizumab, muromonab-CD3, mycophenolate, tacrolimus and sirolimus. Echincea may also increase the effectiveness and the risk of side effects of many common medications including cholesterol-lowering statins like lovastatin, amiodarone, methotrexate, ketoconazole, clarithromycin, diltiazem, estrogen, indinavir, triazolam, clozapine, haloperidol, olanzapine, pentazocine, propranolol, tacrine, theophylline, zileuton and others. Talk to your doctor or pharmacist before taking echinacea if you are taking any prescription drugs.